Class B – Liquids and Greases involve flammable or combustible liquids such as gasoline, kerosene, grease Aden oil. Class B fires involve flammable or combustible liquids. Petroleum, grease and oil fires are included in this class. Class C fires involve Electrical Equipment such as appliances, circuit breakers, , outlets, and wiring. Do not use water to extinguish electrical fires. CO2 - Used with sensitive documents and electronics. FE 36 Cleanguard- Clean, used for sensitive electronics and documents, and computer rooms..
Halotron i - Clean, used for sensitive electronics and documents and computer rooms. Halotron II - Clean, used for sensitive electronics and documents and computer rooms. FM 200 - Usually large tanks connected used used for sensitive electronics and documents, computer rooms and sometimes where explosions may occur..
Water Type - Cools burning material by absorbing heat from burning material. 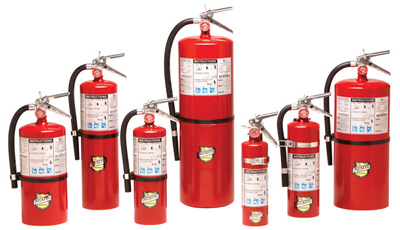 Effective on Class A fires, Water fire extinguishers 2.5 gallons (9 liters) of water in a tall, stainless steel cylinder. Water Mist uses a fine misting nozzle to break up a stream of deionized water. Water Mist - Class A and C fires. The guidelines above are not meant to be all inclusive or for do it yourself fire extinguisher work. These guideline are for general knowledge only. Always consult and use a professional fire protection company and your local Fire Marshal before installing any particular type of fire extinguisher. where areas containing oxidizing materials is not recommended. result in a danger. These areas require a BC Type Fire Extinguisher.